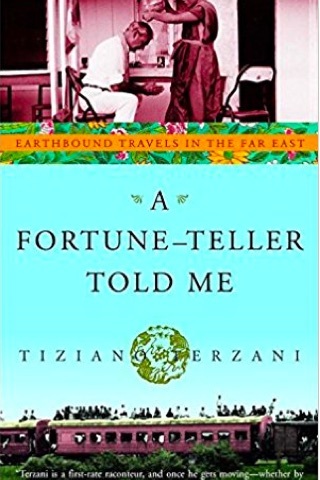 Travel memoir A Fortune Teller Told Me: Earthbound Travels in the Far East , sees Italian journalist Tiziano Terzani roam mostly across the Southeast Asia of the early 1990s, introducing us to some intriguing characters and fascinating anecdotes. Published in 1995, the book shows a snapshot of Asia back then, a meandering and enjoyable read for those particularly interested in the region. His stance is that societies here are being ruined by modernity and a hankering for wealth; the trappings of the West have devastated ancient societies and it’s all very homogenized now. His obsession with moving to India, a place where he feels there’s a chance he’ll still find an unadulterated and authentic culture where tradition is respected, feels naive. His refusal to countenance that the people living in the countries he visits may have some agency in their decisions, at least today, comes across as somewhat patronising. Terzano blames an obsession with the pursuit of money—driven by the venal Chinese—for ruining much of the region, but doesn’t seem to acknowledge or perhaps consider how it was really colonialism itself that created the structures that then allowed development to continue along the trajectory of which he so strongly disapproves. Terzano’s coverage is whimsical and eclectic—he follows his nose and stories as any journalist does—and this also means it’s somewhat uneven in terms of what history he decides to share with readers. The history of Malacca, for instance, is delved into in great detail, but other destinations get a much more cursory description; on the other hand, we can’t think of any other book that covers Thailand’s obscure Betong in such detail. While intrepid on the travel front, it feels a little lazy on the research front; of course, it’s memoir, so naturally a collection of anecdotes from the people Terzano meets, like drivers, hotel owners, architects, translators and politicians appear, but it’s not in any way rigorous. He covers a lot of ground in a year, and often only has an hour or two with the people about whom he writes, extracting their stories to produce their potted life histories. While that may have worked for a book published in 1995, today’s readers might demand the complete stories of those very fortune tellers or seers or shamans in their own voices, or at least the voice of someone who has spent years in a country rather than a few weeks. Nevertheless, something alluring remains about the idea of travel without planes. Terzano writes that his experiment led him to “rediscover the majority of humanity whose very existence we well-nigh forget by dint of flying: the humanity that moves about burdened with bundles and children while the world of the aeroplane passes in every sense over their heads.” And it’s true, that you’ll find out much more if you abandon airports and head for the crowded buses, trains and boats of Southeast Asia; for here, even in 2018, there are still many fascinating stories and histories to be found.